Joining sweet Amanda for weekending . . . . This weekend beautiful and fun and eye-opening. That is a lot for one weekend. My dancing girl danced in her fifth recital. I cannot believe she has been dancing for five years. She really loves it. I hear parents say this a lot. I have heard kids say they love something. It's hard for me to remember being 7 and loving something so much. It looks like I have two seven year-olds who have their passions. Our weekend was full of clay, wood and dance. Elijah made his first clay figure that I think is pretty awesome (I am his mama so I know I am super biased). He took it to school before I could snap a shot for this post. Elijah has been obsessing over clay for months now. He loves making stuff with his hands and has asked for a Leatherman for his birthday. This weekend he chisled a canoe. I need a shot of that too; Elijah tends to make off with his creations, so I'll grab him when he returns from school today. Helena danced her ballet this weekend and declared she wants to be a professional dancer-"definitely ballet, but if not ballet then other kinds of dance. I just want to dance all of the time." She had a wonderful time at her recital and her brothers rallied around her (Eden was asleep which was probably for the best). Somebody enjoys posing. I call this her Lena Horne pose. As per tradition we hit Dairy Queen afterwards. That is always yummy and fun. Then we came home and Helena danced some more, leaping everywhere, practicing her form. I think she has discovered what incredible things her body can do. It's a wonderful reminder for me. Last night almost ended in a few tears as Helena was already missing her ballet teacher and not looking forward to a summer without dancing. So here we go looking up ballet and art workshops and stockpiling more clay . . . .
How was your weekend? I hope your weekend was grand and that your Monday is treating you well. Joining Amanda at the habit of being for weekending . . .
For the love of a calmer weekend-yay! We were in much slower mode this weekend. There was time for board games-love this even with all of the sibling bickering. There was Annie for our Friday movie. I remember going to the theater to see this movie. I forgot Tim Curry was in this and how delightful he, Carol Burnett, and Bernadette Peters were in this film. Seeing bits of Geoffrey Holder's dancing has inspired me to find more of his 'dancing' movies to show to the kiddos. The man moves like water. I had a treat-going out for a seafood dinner with my parents. On Saturday the valentine constructing began. I see just how much Doran loves to paint. I started and restarted my knitted hearts several time over. Let's see if I can work it out today. Luckily the pattern is a short one. Sunday brought cleaning and teamwork. I am trying to help the kiddos understand that we work as a team, and when we do upkeep is so much easier. My homemade wood cleaner concoction went AWOL as a result of their enthusiasm working all over the house, but it was found again. We know now that Doran is not to be trifled with when it comes to vacuuming. The boy is relentless so you'd better get your stuff off of the floor. I gladly chose for Elijah to skip tennis so he could have an impromptu play date with a sweet friend. I was told there were much giggling and laughter. Joy. I gladly got out the modge podge, fingerpaints and fabric for Valentine making. And we all gladly went out for an ice cream parlor treat after dinner despite the 23 degrees registering on the thermometer. Now off to start the week . . . . So you know I am a reformed Valentine's Day celebrant. I have my pink lights up but nothing else so far. I have been grazing Pinterest and the interwebs, gathering bits of this and that. I thought I'd share what I have found-so far, because the gathering never quite stops right. We are going to have a Valentine's Day tea. I know it sounds all kinds of fancy, but in reality it could be anything from homemade cookies, cake and savory tea to Nilla wafers and milk, depending on how my weekend goes. But I am going to try to bust out a few of these. I know Martha says they are for cats, but I think they can work well for people too sans the catnip. I just learned the kfb technique for increasing (thanks Tracey and Dee) so this should work. Perhaps I'll stuff in some lavender with the bell. I like jingly, good-smelling stuff as much as the next cat and so do the kids. I also love these felt Valentine candy holders and these fingerprint hearts. Those would be great for the Valentine's exchanges at school, as would these. We have oodles of cardboard so this is a good way to reuse them. This Valentine's votive is pretty darn cool too. And have you seen this Zakka-inspired Valentine? Cuteness. And then there arefelt tea bags and cookies. I could go on, but for all of our sakes, I'll stop. Time to get off the computer and get to making. I hope you saw something inspiring. Have a great Thursday! I got this idea from a Family Fun craft "brochure" (it's not really a magazine) that a friend gave us. I don't know where she got it, and I haven't seen them in any stores. The "brochure" has some really cute craft ideas. I am sure many of them have been used or done other times and other places, but it's the first time I've seen a few of them. I think I must be paying more attention to things. Anyway, I mentioned a few days ago that I tie-dyed some shirts for the kiddos. Man did that ever take me back to high school. There are healthier dyes out there, but I just used plain old RIT dye this go 'round. I dyed the shirts and the children drew on the jack o'lantern faces with fabric paint. I helped darken the spots that they felt were too light. Working with the paint pen on fabric wasn't very easy for little hands. I haven't started Eden's shirt yet, but we will work on it together when the rest of the children are at school. In order to be sure that the paint sets, we have to let one side of the shirt dry completely before we tackle the other side. These ought to be completed in a few days. In the meantime, here's a peek. I am finding so many fun things to make that can be used year after year for decorating and cheering up the house. What are you making for Fall and/or Halloween? I am joining Amanda over at the habit of being for some long weekending. This weekend was nice and long. We kicked off the weekend with our usual Fish Friday meal and a fun viewing of George of the Jungle. Surprisingly, I really enjoyed this movie. It is an intentionally over-the-top parody, and doesn't taking itself seriously. Thomas Haden Church is always fun to watch too. There was some potty humor which I could have done without. Of course, Greg and the kids got a kick out of it, and I have to admit that I chuckled. I was able to jet to my studio on Saturday and quasi-rescue a painting. It's not done yet, but looks better than it did. You never know how these things are going to turn out. This one might call for some creative matting. We'll see. I started another tomato painting. I do love painting tomatoes. I love painting and I especially love tomatoes. The children had time for pastry from an old-fashioned bakery. They constructed a new fairy house and left some Gorilla Munch out for the fairies. The squirrels appreciated that meal. Sunday we went to mass where Fr. Tom blessed the kidlets' stuffed animals blessed. The blessing was in honor of St. Francis of Assisi. St. Francis is one of my favorites. I actually chose his name for my "saint name" when I was confirmed so many years ago. The blessing of the stuffed animals is always pretty sweet and fun. Fr. Tom called them "keepers of secrets"-very sweet. After mass, we headed off for some apple and pumpkin picking. The recent monsoons have done a lot of damage to the apples. There were mounds and mounds of apples on the ground. I am going to try making some apple jelly. I need to find some cheesecloth quickly. The pumpkins are going to have to wait to be carved as it is wicked hot outside. After some time at the orchard, it was time for soccer for Doran, tennis for Elijah and knitting for me. The cowl is coming along pretty well and the second leg of my legwarmers is moving along much faster than usual. Monday was such a bonus. Greg and I had toyed with the idea of hitting the beach, but opted to stay home and take care of house business. Light switches were repaired, outlets replaced, sheetrock patched, and the garage roof is almost finished. Greg took off the old shingles and nailed on the tar paper. Adding the shingles will have to wait a day or two, but it's sealed now. Maybe we'll go to the beach next weekend. I did laundry (of course) and helped the kids tie-dye some shirts. Well they were content to watch. They will add the jack o'lantern faces to them later. Then it was time to make out the week's breakfast, lunch and dinner menus. I am feeling pretty, pretty organized. I take it where I can find it. Since Greg was on the roof, all of the kids and I went to the grocery store-something I never do if I can help it. Some packages of straws being knocked off the shelf reminded me of why I have this rule. Actually, it wasn't the kids' fault. I blame the three people blocking the aisle and it's intersection for that little mishap. It was no big deal though. I wasn't about to trade places with Greg on the roof. If he can be on the roof, I can definitely hit the air-conditioned grocery store with four young 'uns. We finished up our weekend with some ricotta gnocchi for dinner. We were all pretty beat, well maybe not all of us. For some reason Helena, Elijah and Doran had loads of energy. Eden passed out in the couch pre-bath, and still in her clothes. Greg and I weren't too far behind. Time to start up the week. I hope your weekend was a good one. It's Wednesday so it's time for the weekly Yarn Along with Ginny. Please join in if you would like to share your yarnwork and reads for the week. There hasn't been much knitting going on around these parts. There has been painting, getting ready for school, last minute day trips, but not much knitting. Somehow I am indecisive about what to knit next. The holidays are coming and I am sitting like a bump on a log wondering what to tackle next. So of course while I am sitting and wondering, I thought I should make something. And so, you guessed it, I cast on for another bookmark. The kids want at least one each and the holidays are coming, so indulging in my bookmark addiction is justified. But seriously I do have to get off my duff and make a decision about my next project. Enough dithering already. What are you creating and reading this week? I swear that stack of paper was two inches thick! ;-) Sorry for the blurriness; I still haven't made complete friends with the point and shoot in cloudy and dark conditions. She likes evening light. I understand the preference. Hopefully my camera will come home soon from the repair shop. Elijah has been fabricating parachutes. It's fun to watch him. He gets an idea in his head, makes up a pattern and he's off. Well technically it was soap melting-super easy. 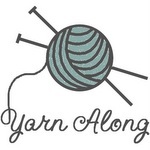 Today I am joining Ginny over at Small Things for her weekly Yarn Along. Join in and share what you are knitting or crocheting and reading this week. After finishing Elijah's Elf Hat last week, I am still searching for my next knitting project. I need more than one project on my needles. The leg warmers are coming along. I am still on Leg One, but each week, it's a little longer than it was the week before. But back to the new project. I can't decide if I should knit some end-of-the-year teacher gifts. You know how long that hat took, I am almost afraid to commit to knitting something for fear that the teachers won't get their gifts until September. Still Ravelry calls, as do my favorite knitting pattern books. I might just be able to pull off the seed-stitch bracelet, the linen bookmark and the big lace scarf before June 17th. Maybe. Since I am focused on gifts (teacher and Christmas), my reading this week consists of what shall we do today?, Last-Minute Knitted Gifts, and more Last-Minute Knitted Gifts. I wonder how I came to like the "last-minute" series so well? ;-) what shall we do today? is not so much a knitting book as it is a great general craft book for kiddos and their parents. I am hoping to get the kiddos involved in this end-of-the-school-year flurry of gift-making. The peppermint leg warmers are coming along. Each week the one leg I am working on is a little longer than it was the week before. That's how it's done-week by week, row by row, stitch by stitch. What are you creating and reading lately?